A good turnout today, about a dozen, which was very heartening. What do you mean, Multi Storey Carp Ark? We even had the visit of Steve our JCB driver, out for a cup of tea and a biscuit, which we provided with a generous smile. He did have to listen to a few jokes from John though, that is the price you pay for a free cup of tea and a ginger biscuit. We set off for Gotherington Manor Lane again, to continue with the faults list from last week. It was a long, hot walk down to where we left off last week. 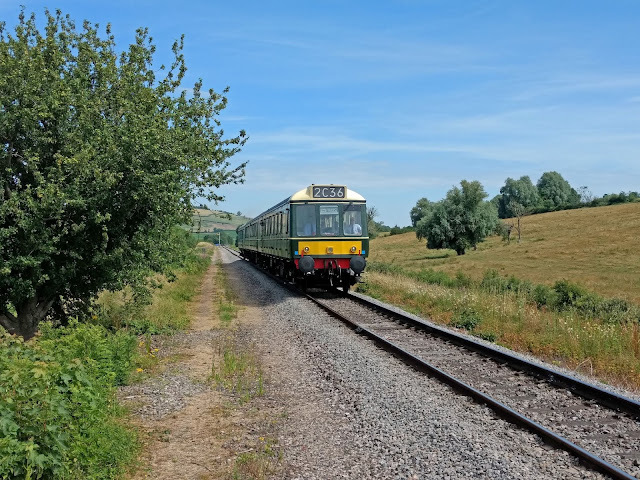 We let the first train ex Toddington go by, to pick its crowd of passengers up from CRC. Dinmore on duty today, together with the DMU. It must have been hot on that footplate. Luckily they were going tender first, you get a nice breeze. 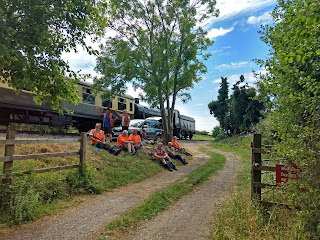 We had a small gang split off with the express purpose of lubricating the CWR breather at Bishops Cleeve. On the way they also lubricated the threads of the fishplate bolts. That grease.... notice how close the tin is to Peter's leg. More of that later. 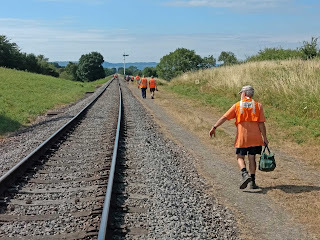 They then set off on the long, straight walk to the next station, where there is a stretch of CWR, with a breather at each end. Notice the little dot in the top left corner? Here it is blown up a little further. It was a Chinook, chop-chopping its way across the sky with that unmistakable sound. 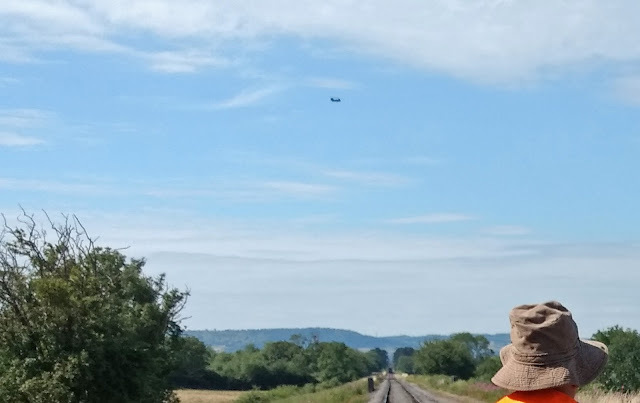 A number of transport planes were also seen, there must be a flap on somewhere (as they used to say). 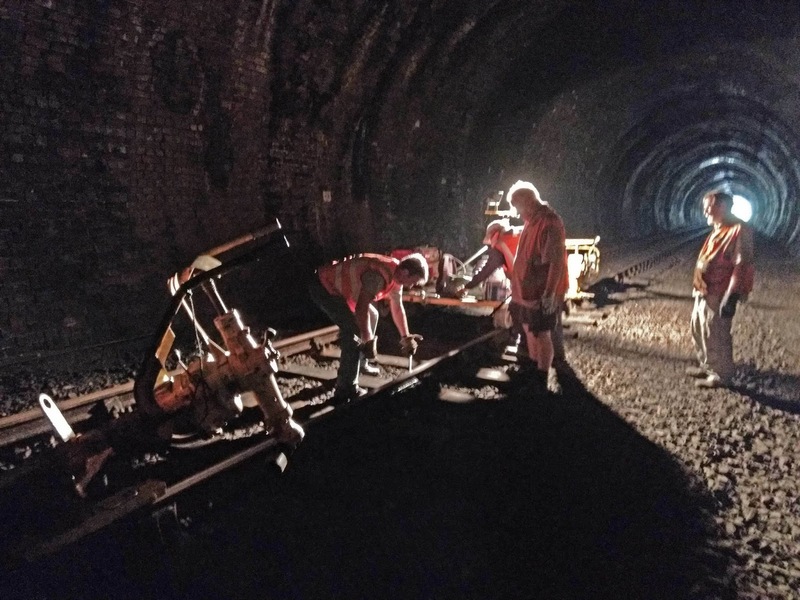 By the time Dinmore returned with its carriages filled with Broadway hopefuls, we were on site and started to find those missing clips, which need to be replaced with new and stiffer ones, or have a thicker pad inserted underneath. It is an obligation imposed on us not only to acknowledge the whistle of the the loco, but to wave to every child on board (sigh). What is it about waving, but we instinctively all want to do it? 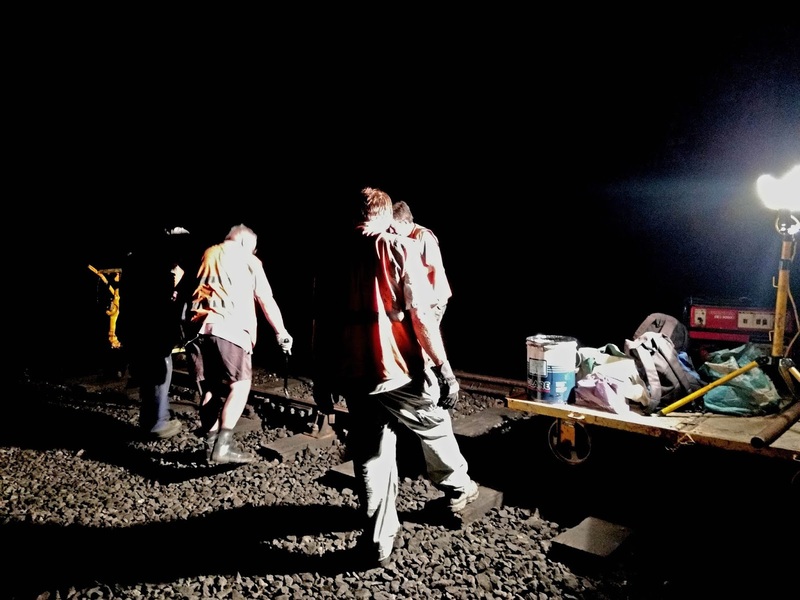 Here we are on a foot crossing, where the ballast is being dug out to place a pan jack. Behind the little gang is a vast new housing estate, which is marching outwards from Bishops Cleeve and getting nearer and nearer to the next peaceful village, Gotherington. Bovis, we heard, have already acquired that empty field. Here's a picture of how we deal with the loose clips, by jacking up the rail, scraping the bed with a screwdriver (putting your finger under the rail is not a good idea) and then inserting an additional rubber pad. This takes up the extra room created by a worn, second hand sleeper. Each loose clip takes about 15 mins, including gathering up the tools and walking to the next one - and in between the second working comes along, our trusty DMU. 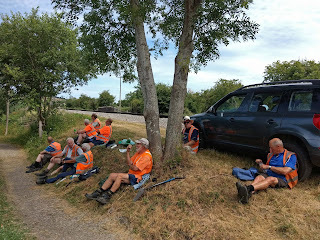 For lunch, we walked all the way back to Manor Lane, as this is where we parked the cars, and we remembered the shady picnic spot from last week. It was great to sit in the shade here. 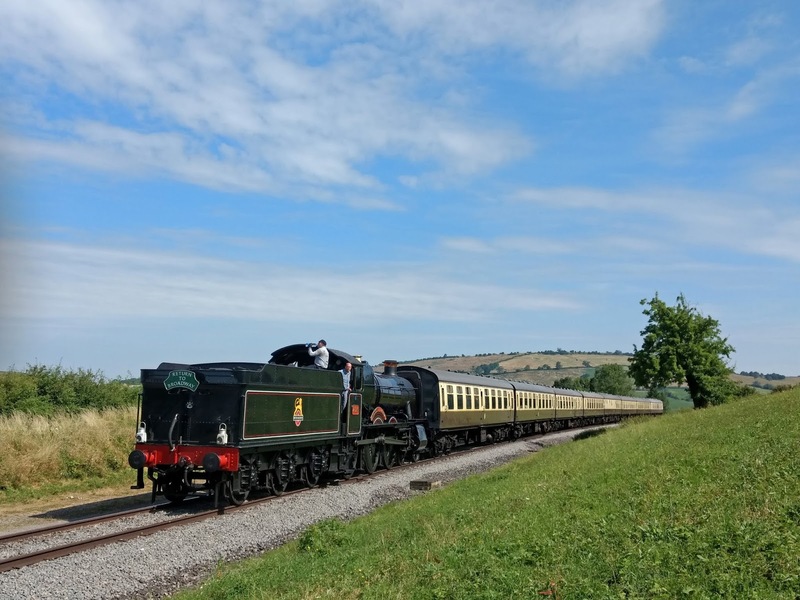 During lunch, Dinmore Manor returned from Broadway, on its second trip to Cheltenham. Here it is crossing the brick built arch over Manor Lane. Brick arch bridges are something of a rarity on our line, most are made of steel by the venerable company of E. Finch & Co, from Chepstow. Here is our access to the trackbed from Manor Lane. It sees quite a bit of use, not only from us but also from the Drainage Department, which has been working in the area. Honey, I'm home! Oh no you're not, you're sleeping in the garage tonight! The greasing gang did both breathers at Bishops Cleeve, and walked all the way back, thus completing their 10.000 steps for the day. 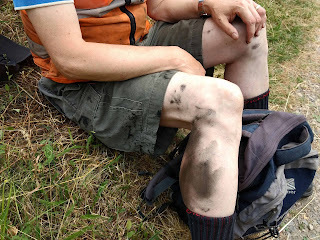 The proximity of the grease tin to the user's leg had fatal consequences as you can see. And that stuff spreads all over the body, from the place where it first landed. Further along the trackbed towards the new housing estate we found new broken glass in the four foot. This location meant that it could not have been thrown from the train (and we do not sell Magners, nor wine bottles priced at £13.99). Somebody took them up here. This footpath underbridge has been clean for 113 years. Comes a new housing estate, and we get graffiti sprayed on it. Could the two be connected? The graffiti was even dated. It coincides with a very unpleasant encounter with local youth here by the drainage gang. Next to the replacement of clips, pads and plastics we also did some ballast shovelling, removing some excesses so that all clips are visible to our track walkers (and not buried under ballast). This is very hot work on a day like today, when the thermometer reached 28 again. While turning Dave's Discovery at Bishops Cleeve we stopped to have a look at the northern breather of the CWR through the station site. The CWR is coping well and we have no reports of any buckles, neither here nor on the Broadway extension. Quality work. Some of the fences at Bishops Cleeve struck us as odd. 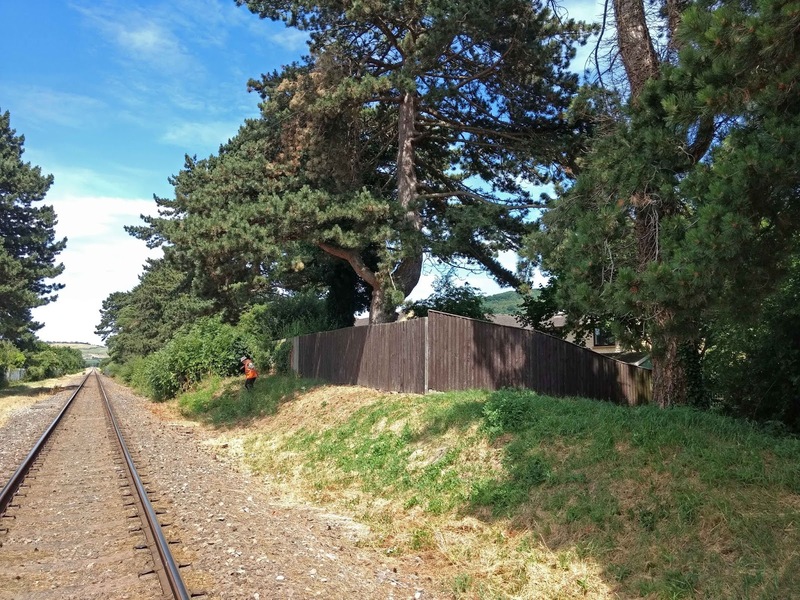 This area here (we could be wrong) looks as if a neighbour helped himself to an extra bit of our property, erecting a new fence right around the pine trees that clearly marked the confines of the former station. The centre pine tree is just a few inches inside the fence. We finished our day with a refreshing cup of tea outside the Coffeepot, where we met David and Diana B of Saturday and Wing Walking fame. Today they came in mufti, giving their impressive Harley an outing, and thrilling us with the sound of it's thumping 1500cc twin engine. Our third day of fishplate greasing. 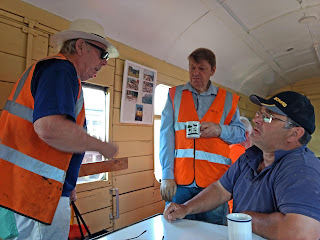 Great was our joy to find 5 volunteers in the mess coach first thing, a vast improvement on the three the previous Monday. 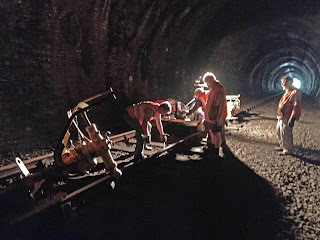 Somewhat tongue in cheek your blogger suggested an alternative to working in the unrelenting sun - how about greasing the fishplates in the tunnel? Brilliant idea! We did exactly that, what a good way of avoiding sunburn. 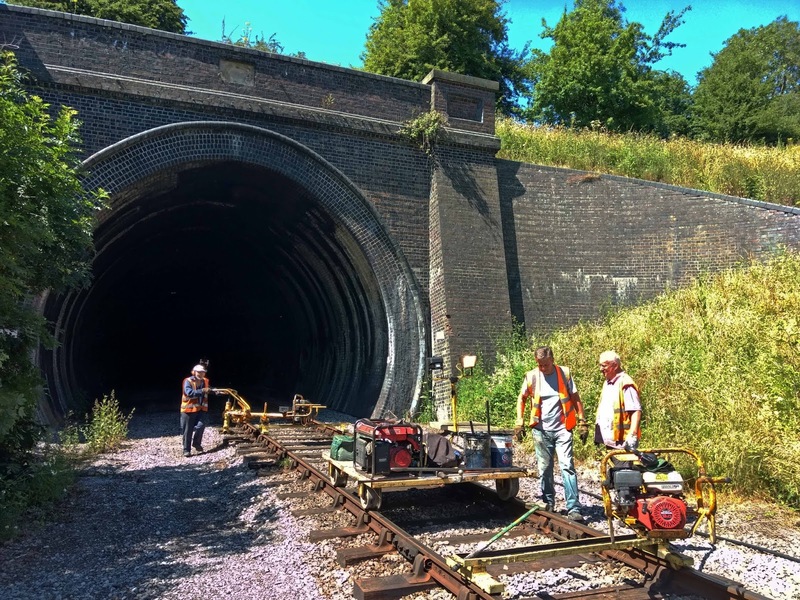 Here we are pushing our 3 vehicles in the opposite direction, through Winchcombe station and up to Greet tunnel at the end of the cutting. We had the two TB2 machines out as usual, but as it was dark in the tunnel- 'not a lot of people know that' - we had a generator and two lights mounted on the trolley. Greet tunnel is nearly 700yds long, and curved at one end, so you can't see through it. Quite light at the Winchcombe end, it gets darker and darker as you go in, until you are in total darkness in the area of the curve. Here you can still see the Winchcombe end in the background. 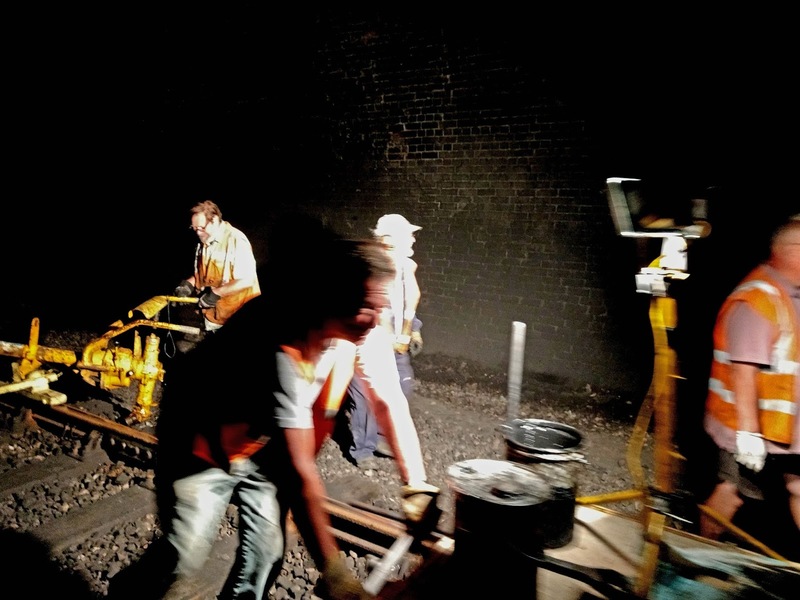 The TB2 in the foreground has loosened the fishplates, and the trolley crew are just applying the grease. At the rear is the second TB2, ready to do everything up again. All the lights are around the trolley. You can just about make out the 4 bolts, which Robert is busy greasing here. 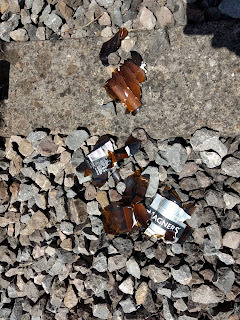 Here too we found fresh evidence of trespass, in the form of 3 shiny cider and beer cans of brands that we do not sell, plus a take away coffee cup, all together in a pile that would look much more scattered if thrown out of the window of a moving train. 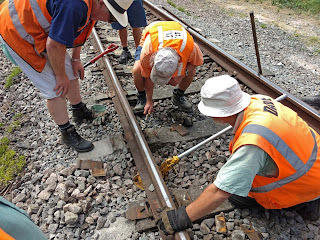 While the trolley crew move on, Dave on the second TB2 tightens the fishplate bolts again. Aren't these smartphone cameras flexible? These pictures, albeit a little blurred, were taken in the depths of the tunnel, and without flash. The leading TB2 machine was always in the dark, so finding the fishplates and then the nuts involved a lot of guesswork. 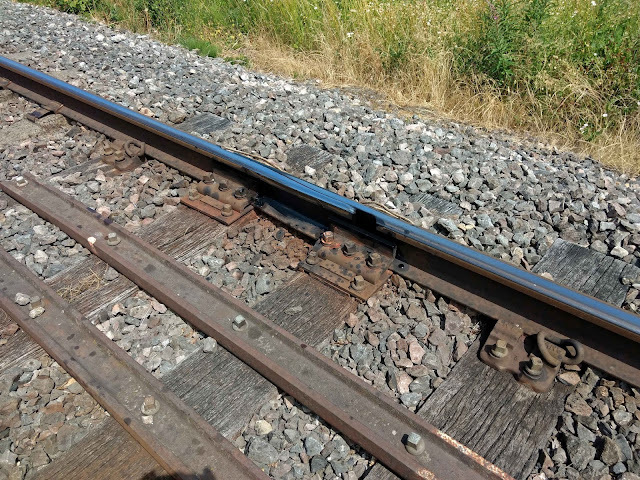 It was 60 paces from one fishplate to the next - we had welded some rails together. After 60 paces, you stopped pushing and groped around in the dark. Here the leading TB2 is a silhouette, with the light equipped trolley just arriving from the previous job. We're right in the middle of the curve, so there is no light visible at either end. Because of the longer rails, we worked ourselves through it in one direction in only an hour or two. 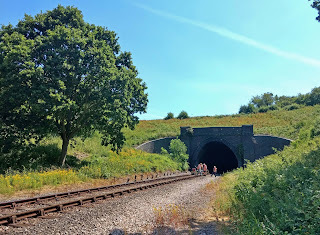 We then emerged at the Greet end of the tunnel, where we ate our picnic lunch by sitting on the trolley, which we parked just inside the tunnel to profit from the shade it gave. Group photograph of the relaying gang at Greet, 14th May 1988, taken by John Lees. 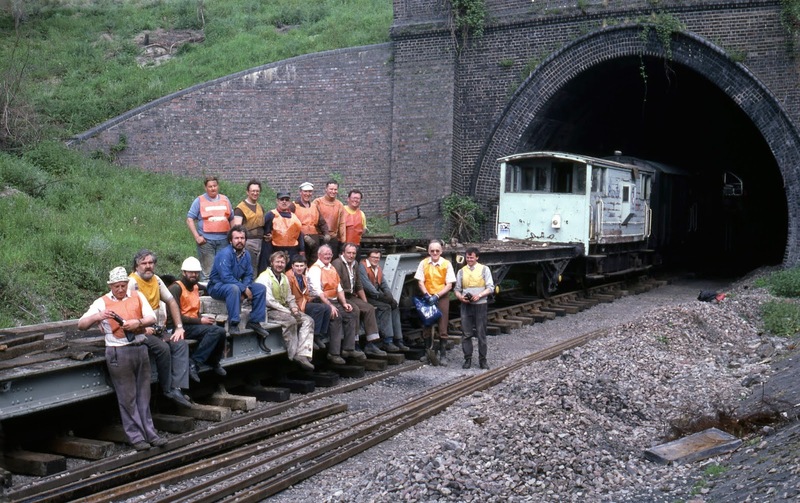 In May 1988 the same spot was occupied by the pioneers that laid our GWSR railway, 9 years after BR lifted the track. 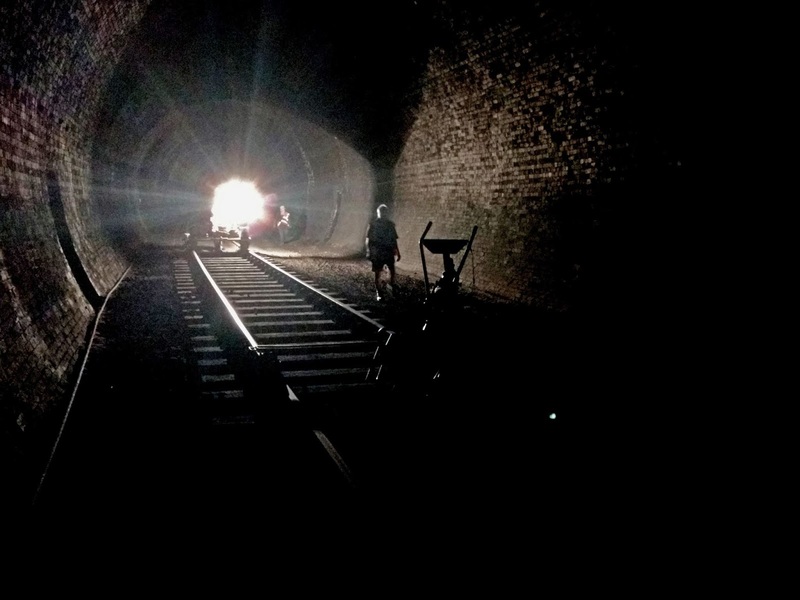 They had just emerged from the tunnel with the track laying train. Left to right back row :- Jim Wooldridge, Ivor Dixon, (Unknown), John Tucker, Bob Mackintosh, Mike Howse. Left to right front row :- Charles Martin, Garry Owen, (Unknown), Dave Heathcote, Steve Long, Chris Bagley, John Randall, Ed Bound, Tom Couling, (Unknown), Malcolm Hill. Lurking in the tunnel is a class14. Believe it or not, two of this happy group are still regular volunteers on the track gang today: Steve Long, and Ivor Dixon. Garry Owen, former HOD, drops in to help in the mess coach too. Not forgetting John Lees, who took the picture, who is also often found out on Saturdays still. 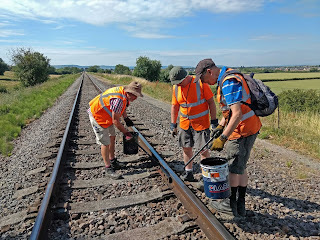 After lunch, we worked our way back through the tunnel doing the other rail, and mid afternoon our little gang of 5 emerged again at the Winchcombe end, blinking in the bright sunlight, and somewhat greasier and blacker than before. Greasier and blacker? 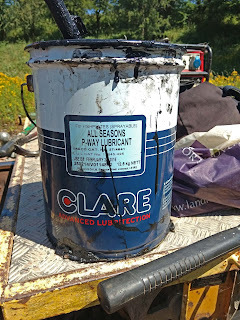 It's because of this 'Advanced Lubrication'. And we thought it was just oily black stuff. Boy, it sure gets everywhere, no matter how careful you are. 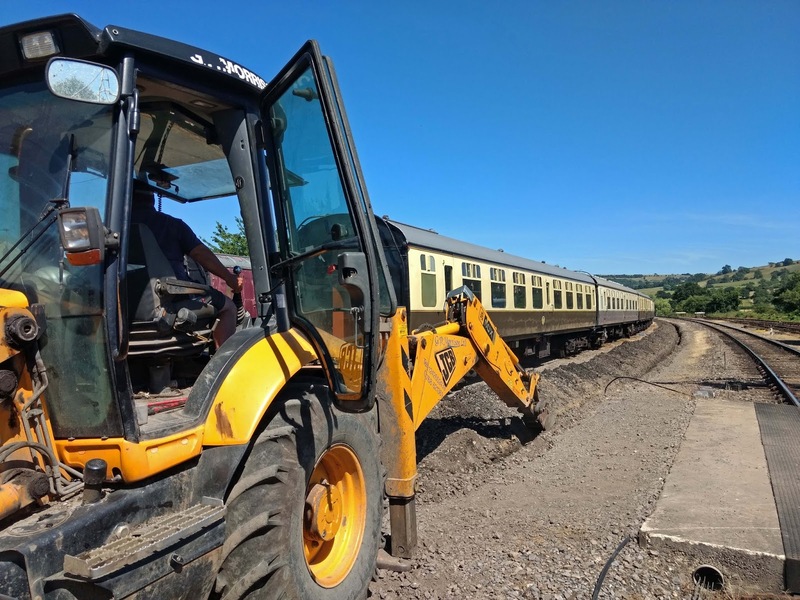 Back in the PWay yard at Winchcombe, we found Stevie digging a trench for a replacement communications cable. This is an interesting development. Why the new cable? Because the siding with the 3rd rake on it is going to be completely relaid and (partially) straightened. The old cable ran an irregular path and would be in the way. 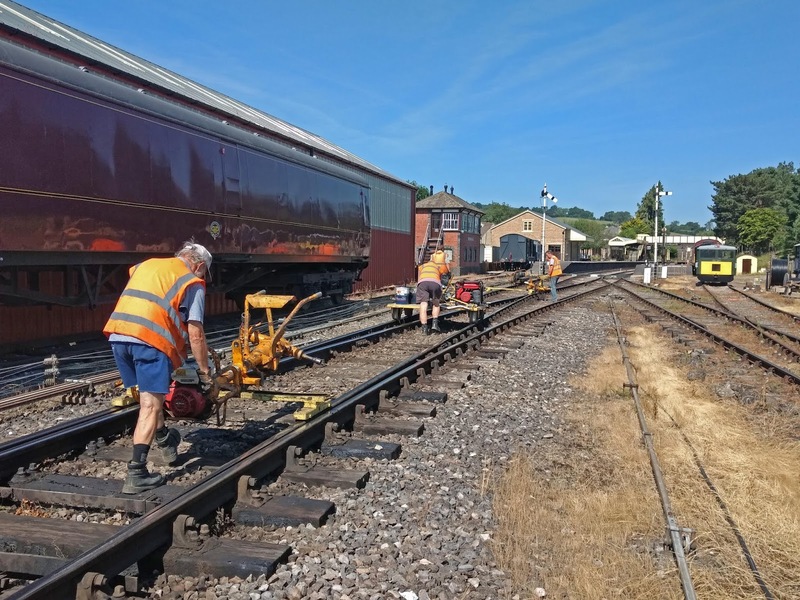 The siding improvement is for C&W who want a proper running stock siding, on which they can do light maintenance without having to lie in the dirt, or scrabble around for water and electricity. The relay has nothing to do with the possible location for a carriage storage shed, the site of which is being discussed at this very moment. A recent investigation looked at siting it on the other side of the running line here, at the back on the right and reaching right to the gates of the yard, where the decrepid stock is currently parked. This would give a full 8 coach length, and on firm ground. Other factors also play with the location, and we await the final decision. 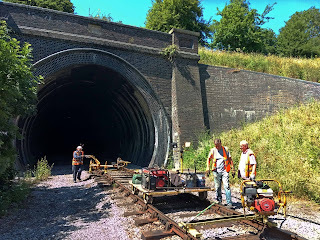 A further fishplate greasing session will take place on Monday (perhaps combined with the replacement of 6 bolts in the tunnel while we have a possession) so do come and help. 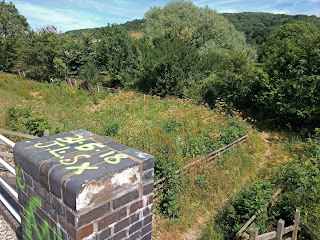 It must be infuriating to see the paint vandals' mindless scribblings on the bridge blue brickwork while you all work so hard to improve the railway environment. Hopefully the planners will not allow Bovis and the like to creep too much further towards Gotherington and Greet threatening their village identity. Will your estates people be looking into the alleged land grabber at Bishop Cleeve? Nah, I doubt the planners give a damn. In fact, I don’t think think that they can even keep the word “planner” in their job titles. In my village in North Glos they have totally surrounded the not-so-old school with houses, completely oblivious to the fact that more houses means more children which means the school is now not big enough. How idiotic can you get? The process of absorbing the villages north of Cheltenham into an extended suburb of the town itself has been going on for years. I grew up in Prestbury - on one of the 1960s housing estates that filled the gap between the village and the town. I went to school in Bishops Cleeve. I saw the 1970s housing estates being built that turned Bishops Cleeve and Woodmancote into one town. I saw Cleeve School being extended, and extended, and extended again, as more and more pupils moved into the area. That process has continued. Cleeve School is now massive compared to my day, and it wasn't a small school even then. I can remember people saying years ago that it was only a matter of time before Gotherington was absorbed into the sprawl. It's taken a bit longer to happen than everybody assumed (and it hasn't *quite* happened yet), but it's coming. I believe the ultimate plan is for Prestbury-Southam-Woodmancote-Bishops Cleeve-Gotherington to be subsumed into vastly extended northern suburbs of Cheltenham. Of course, it'll take a few years to happen, and the developers might not have it all their own way. A development which would have extended Prestbury in the direction of Southam was recently turned down by the planners. But the land is still owned by the developers, and I'm sure they'll try again. 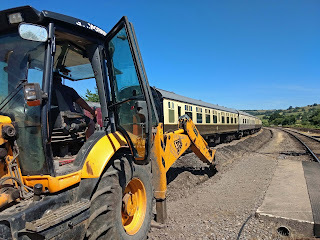 All of this does give the GWSR a bit of a challenge. On the one hand, the new developments bring a lot of potential passengers (and volunteers!) into the area. But, as the southern part of the line becomes increasingly built up, it's also likely that what you might call 'urban problems' will start to be an issue. The Severn Valley Railway faced this sort of situation when they started running into Kidderminster. All of a sudden their quiet country branch line had a rather edgy urban section. If I recall correctly, the SVR dealt with it by reaching out to local people, and getting them involved in the railway. They realised that simply trying to police the problems wouldn't work - they had to get the locals on their side. 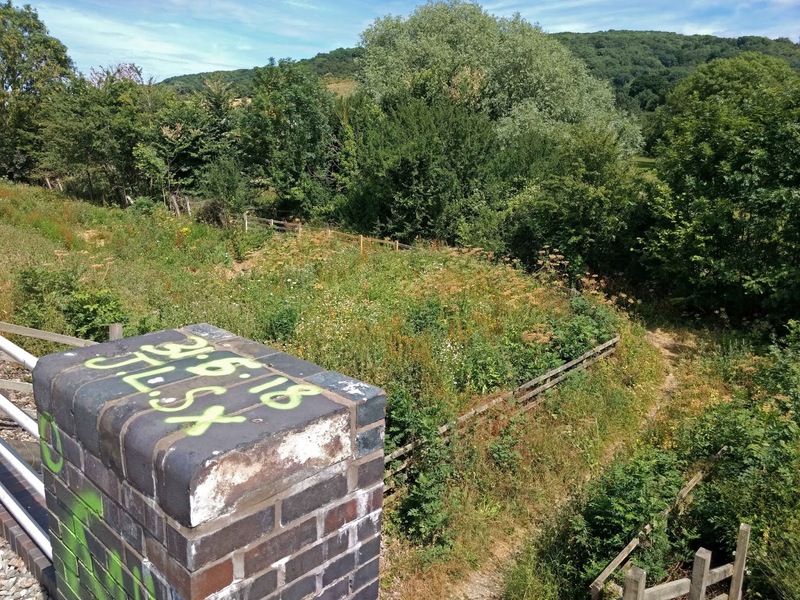 If graffiti, trespassing, and vandalism becomes an issue in the future (and that may well happen...) I'm sure there will be calls for more security fencing: to treat Bishops Cleeve as hostile territory. Security will become increasingly important, that's for sure. But I don't think there's much future in the 'We don't like you!' attitude. 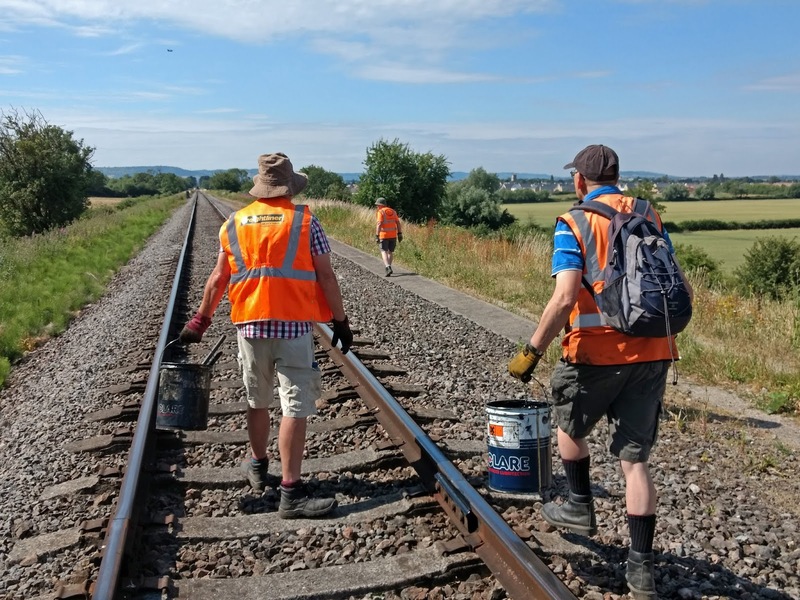 One way or another, I think the railway will have to positively engage with the local people - or the the local people will negatively engage with the railway. In the longer term, I think a station at Bishops Cleeve would be a good idea. 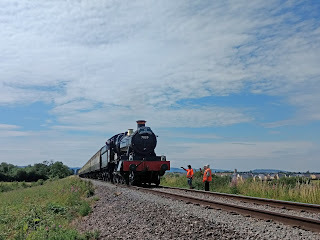 Not only because it makes no sense for trains to steam straight past all those potential passengers, but also because a station project, with as many volunteers as possible recruited from Bishops Cleeve area, would be just the sort of positive engagement that would give people a stake in 'their' railway - and stop the bad stuff before it really gets started. 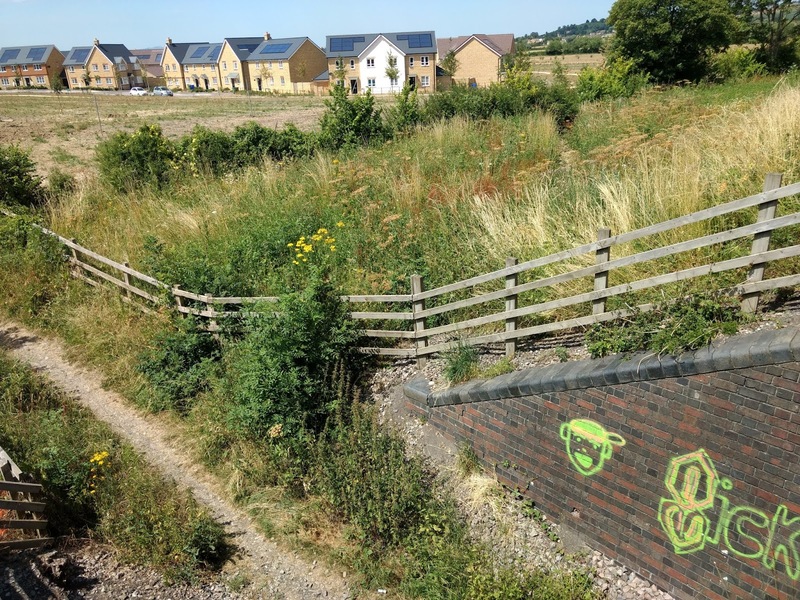 How about some signs "covert cameras in area"
Sad to see the spray tin idiots have arrived on the railway, you can see where they have come from on the map as the new development has made that bridge easily accessible. First thing I would do is ask BTP to pay a visit to every school/ 6th form in the area to explain to Tarquin et al that it's firstly very dangerous to trespass on a railway, it's also a criminal offence and could get you a £1,000 fine or even a prison sentence. They should also be shown pictures of remains of fellow "artists" Harrison Scott-Hood, Jack Gilbert and Alberto Carrasco when they were scraped off Loughborough Junction. Forgot, also ask BTP to visit the home owner who's trespassing on the railway with their fence and garden..... Think they are due a £1,000 fine and criminal record! In the 1980s some railway land at Bishops Cleeve was sold to houses adjacent to the line, so they could extend their gardens. Some householders had already done this unofficially, and it was felt that the best solution was to offer residents a way of making the situation legal. But as far as I know the only place where this was done was just south of Two Hedges Road bridge. If you look at the houses along the top of the cutting here, you can see how the fence line has been pushed out. In some gardens it's possible to see the original railway fence, still in situ half-way down the garden. There's a house at Bishops Cleeve (north of the foot crossing) where someone's put a gate in their back fence, so they can walk out onto the line. They've even constructed steps down to the track bed. At Kayte Lane bridge a large chunk of railway land at the top of the cutting has been grabbed by an adjacent landowner by moving his fence out - digging away some of the bank in the process. 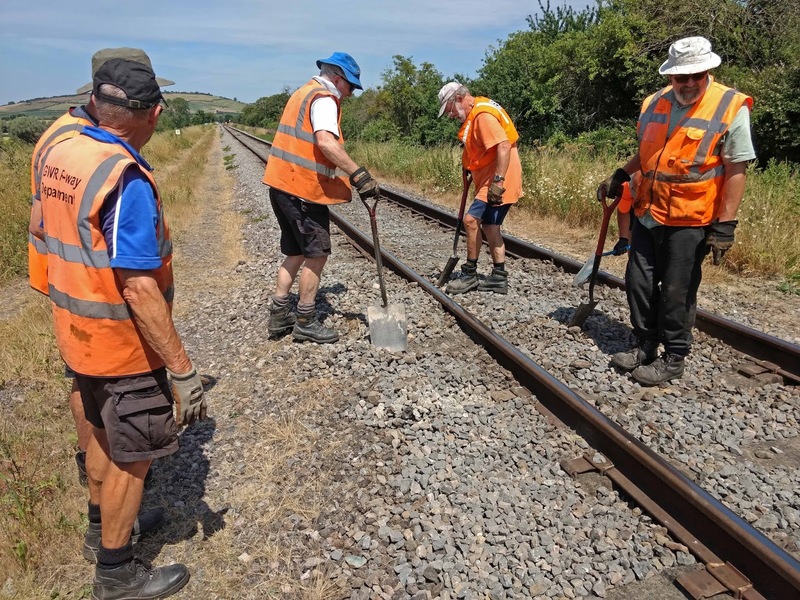 Given the instability of earthworks along the line, I find it incredible that the GWSR is happy to allow random people to chop bits out of railway earthworks like this. If the bank slips as a result of this unauthorised digging, who is responsible? A similar thing has happened at Pittville, on the section owned by the GWSR but not used. 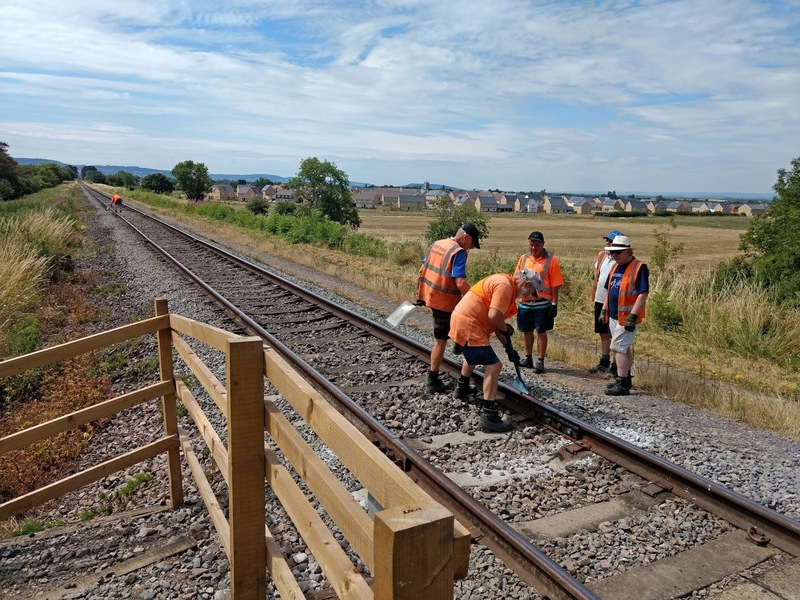 A new housing estate has been built alongside the line, and as part of the landscaping the railway fences have been removed and the embankment dug away and reprofiled. This involved digging into the embankment at its base - something which can't exactly help its stability. Do the residents of the new houses at the bottom of the embankment feel lucky, I wonder? The line from Hunting Butts Tunnel to Pittville has become an unofficial footpath - which in itself is a potential legal issue. 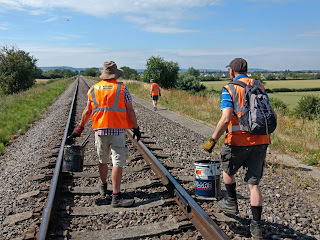 If the GWSR does not assert its rights over the land (which can be done quite simply by putting up a sign or two), the footpath becomes a public right of way after 20 years of unchallenged use. If that happens, the GWSR will lose control of its own land. I'm genuinely baffled that the PLC doesn't seem to care about any of this. I've tried to alert the appropriate people to what's going on, and all I've got in return is a deafening silence. I can only assume nobody wants to open a legal can of worms. However, I have decided not to buy any more shares untill these issues are resolved (or at least acknowledged). After all, it seems a bit silly to buy shares in the railway, only to watch my investment get smaller and smaller - literally! - as people steal railway land. I mentioned Kayte Lane bridge above. I should have said Southam Lane bridge. That's where a local landowner has grabbed a strip of railway land and dug away some of the cutting bank. The land is located between the railway line and Kayte Lane, which joins Southam Lane immediately west of the bridge. Google has a relatively recent aerial photo of the location, which actually shows the landowner's new fence, clearly further in towards the railway than the original fence line - which can be seen at the top of the photo. My post on the blog was deleted on the grounds that it was not an appropriate place to to discuss the issue. But now that the blog itself has raised the issue of land encroachment, I assume it *is* an appropriate place! 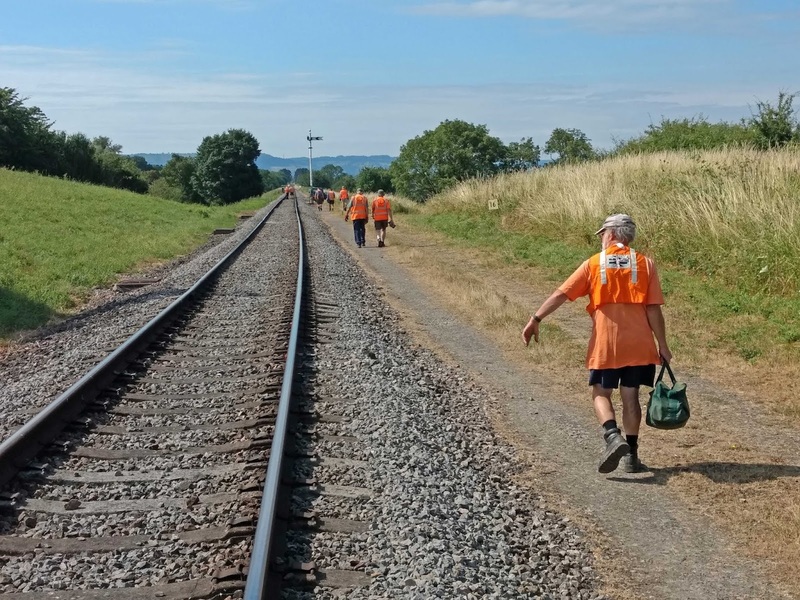 If the GWSR did decide to seek redress for land grabs along the line, the British Transport Police would not be involved. The BTP only polices Network Rail lines. 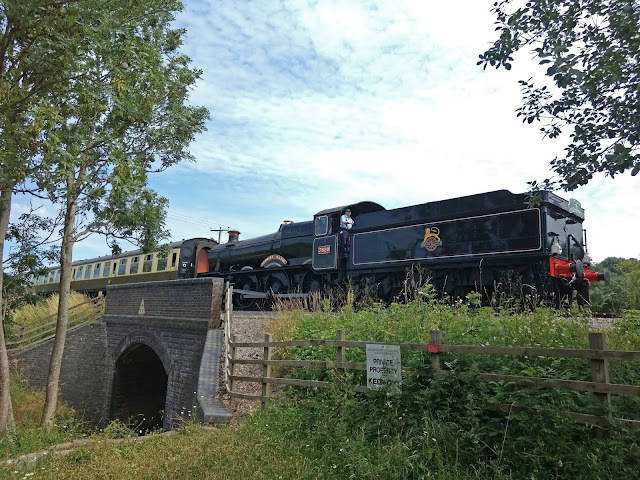 Heritage Railways have to rely on local police forces. But even then, it would not be a police case. Adverse Possession of land is a civil matter. It is up to the owner of the land that has been grabbed to take legal action. If no action is taken, after a certain number of years the person who has grabbed the land can apply to become its rightful owner. 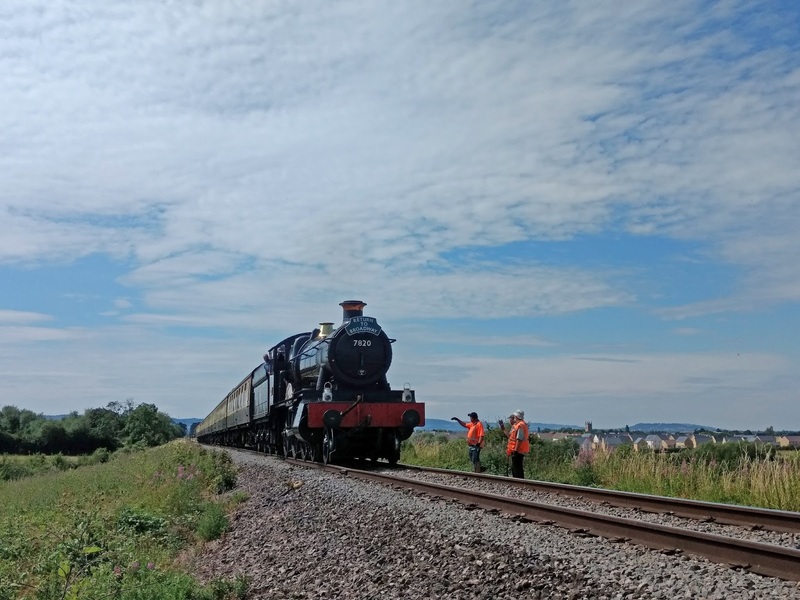 The details differ slightly according to when the land was first enclosed, but as a general principle it's down to the GWSR to police its boundaries - something which, unfortunately, the company has been unwilling to do for the past few years at least. THANK YOU for posting these TWO comments, so that MORE people are aware of the problems that the GWSR Board are facing. No, they are not, we pay for all the costs of the beams. The insurance companies pay, if and when they are happy with the amounts (not at all a foregone conclusion) only the exact costs of repairing it. You are in breach of the law if you pass the circular height prohibition notice and your vehicle is higher. It is no longer a 'warning' notice. RE: "This footpath underbridge has been clean for 113 years. Comes a new housing estate, and we get graffiti sprayed on it. Could the two be connected? The graffiti was even dated. It coincides with a very unpleasant encounter with local youth here by the drainage gang."